Dublin Mountain Golf Club is an, 18-hole Parkland course nestling at the foot of the Dublin Wicklow Mountains. 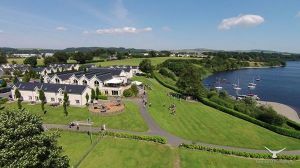 Founded in 1993 and designed by Declan Carroll, Dublin Mountain are constantly making improvements to their course and have plans in the pipeline for a new clubhouse. Measuring 5,635 metres with a Par 71 and standard scratch of 69 off the men's tees. The ladies course at 5,190 metres has a Par of 73 and SSS 71 . The views from this course are breathtaking and the signature hole is undoubtedly the 11th 405 metres requiring a good tee shot followed by a second to a sloping green with a quarry to the right-hand-side awaiting any wayward shot. Brendan Keenan won the Bronze Medal at the inaugural Ulster Bank All-Ireland Medal Championships at Athlone Golf Club on October 6th 2002, when he returned a score of 74. Deborah Carolan (23) Mick Moriarty (9) qualified for the National finals of the Spar-Irish Independent Mixed Challenge at Tullamore Golf Club with 58 points in June 2002. Congratulations to Mick Moriarty (10), who teamed up with Deborah Carolan (20) of The Hibernian Golf Club, in the Spar-Irish Independent Mixed Pairs Challenge. At Adare Manor Golf & Country Club. On the 25th of August 2001 they finished a shot of the winners in the Irish Final. However, they still went to Tenerife in the first week in November for the big shoot out. They qualified for the Finals at Westmanstown Golf Club when they returned a score of 54 points to take the final slot. On the Golf del Sur championship course in Tenerife they became Mixed Pairs National champions with a fine score of 160 nine better than their nearest rivals. Dublin Mountain won the Dublin Team Trophy in 1999.